I am a pro at procrastinating. In fact, I'm procrastinating as I write this on Wednesday evening and scheduling to have this post hit on Thursday. Some call that working ahead. Unless your sculpting a post to hit the next evening because during that next evening you'll be cleaning because you could have done it on Wednesday evening (or Tuesday or even Monday for that matter) but instead decided to put it off by eating and tweeting and tving and interneting and blogging and reading and texting and finding out how to safely clean your leah legacy striped coach bag. But I did clean a little bit tonight. I promise. The kitchen is 90% done. The dinning room is 80% 70% done. And I haven't made the living room any much worse than it was (which was pretty good to start with). I'm pretty sure I've switched tenses a few times in this post. Oh well. While 90% of the kitchen was being cleaned and "dinner" (does oriental salad count?) was being made I found myself having to either move this guy or pick him up off the ground every time I opened the fridge to get some thing out or put something away (which was a lot). Some times I even just opened the fridge to move the guy because he hadn't been moved for a while. Does that ever happen to you? It's always the same item and for a few days it seems to be in the way whenever you try to get anything out of the fridge. If its no where near the milk, it will fall on the floor while you're getting the milk just so it gets some attention. 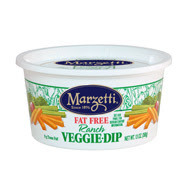 Tonight's food product wreaking havoc when I opened the fridge door was T. Marzetti's delicious Light Ranch Veggie Dip. Did you know this is gluten free? Does that not mean anything to you either? Good. Did you also know that T. Marzetti's headquarters are in Columbus? Super Cool.